DISTRIBUTION - Barred sand bass range Santa Cruz south to Bahia Magdalena, Baja California, Mexico. They are rare north of Pt. Conception. Sand bass chiefly inhabitat the shallow waters near the southern California mainland, but have be captured at depths as great as 600 feet. Young sand bass are abundant in very shallow water (5 to 30 feet). The name "sand bass" is a somewhat unfortunate since they are usually closely associated with sand/rock interfaces of deep reefs and artificial structures and a rarely found out over sandy expanses. Sand bass can be 6 inches after one year and are legal size (12 inches) at 6 years. DIET - Small fishes (including anchovies, sardines, midshipman), squid, octopus, crabs, and clams. 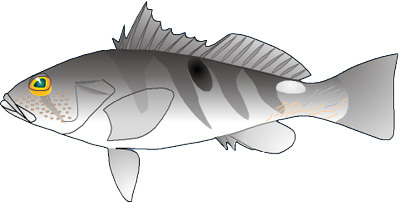 REPRODUCTION - Barred sand bass mature between 7 and 10.5 inches in length and about 3 to 5 years. Sand bass form large breeding aggregations over sandy bottoms at depths of 60 - 90 feet in the summer months. Spawning occurs in these aggregations from April through November usually peaking in July. During spawning, high-contrast, gray and white individuals with large golden-yellow crescents under their eyes are usually males. Sand bass lay a large number of small pelagic (floating) eggs which enter the plankton in coastal waters. Young-of-the-year sand bass appear in shallow, nearshore waters in the Fall. FISHERY - Barred sand bass are rivaled only by the kelp bass in importance to the nearshore recreational species catch in the waters off of Southern California and northern Baja. In some years, in certain locations, barred sand bass can comprise as much as 17 % of all fish taken by the southern California marine recreational catch. Private and party boats take the most of the sand bass while fishing the summer spawning aggregations.